As children grow in this world, we need to provide them with tools and methods to ensure that they are the best human beings that they can be. 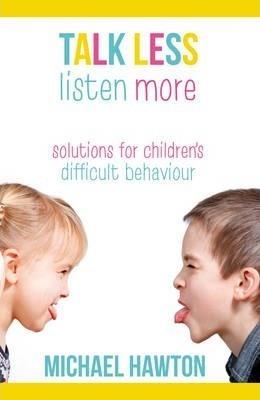 Talk Less, Listen More provides parents with strategies and ideas on how to ensure children take responsibility for their actions and are able to determine what is appropriate behaviour. Michael Hawton provides examples, illustrations, maps diagrams and practical information for parents to help them through this sometimes turbulent time. Throughout the book, and through the learning of these new strategies, parents will work out what to do in the most difficult moments and to stop these times morphing into train wrecks. Written in simply everyday language, using simple strategies, the end result will be that children will be able to assume better self-control of their actions, and be able to monitor their behavior in any given situations. Suitable for today's modern family, you will learn to parent your children more gracefully with basic and simple strategies. That will in turn, will reduce stress levels and increase the level of harmony in your family life. Michael Hawton is a psychologist, teacher, author and father of two. He studied teaching and went to Melbourne University and Victoria University where he trained to be a psychologist. For most of his twenty-five-year career he has worked in the area of child and family therapy. His career has also included working as an expert witness in the NSW Children's Court and for the Family Court of Australia, where he has prepared over 1,000 Child Welfare Reports. Michael has trained over 6,500 family services professionals, nationally and internationally, in how to manage children's and teenager's difficult behaviour. Michael currently travels around Australia to present professional development to family service professionals. His passion is to make a difference to the lives of children and their parents. As a child he played rugby league and now enjoys ocean swimming. He lives in Byron Bay where he has raised two children with his wife Simone. Together they run the online parent resource company-Parentshop.